Donkeys were first domesticated around 5,000 years ago as beasts of burden and companions, most likely in Egypt or Mesopotamia. There are about 41 million donkeys in the world today; China has the most with 11 million, followed by Pakistan, Ethiopia, and Mexico. Donkeys vary considerably in size, depending on breed and management. The height at the withers ranges from 7.3 hands (31 inches or 79 cm) to 15.3 hands (63 inches or 160 cm), and they weigh from 80 to 480 kg (180 to 1,060 lb.). Working donkeys in the poorest countries have a life expectancy of 12 to 15 years; and in more prosperous countries, they may have a lifespan of 30 to 50 years. We are still working on this list. If you have any pictures or information about one of these breeds that you would like to share please contact us. We would love to get your help. At the end of ‘800 this donkey was well spotted in the area of Amiata mountains in Tuscany, a uniform population of grey coated donkeys with special black and white stripes in the limbs and a scapular cross Thanks to their slender and nimble shape, they could go up to steep and rough mountains. Neurotic and good-natured as well, these donkeys had a large diffusion mainly as recurrent winners in the traditional ‘palio’. Thanks to the Horse Increase Institute at Pisa a group of these donkeys have been preserved with known ascendants and various blood lines. Content and Photo source: Agraria.org. Anatolia Donkeys are also known as Brown Donkeys and are mainly found throughout Turkey. They are usually black and gray. Anatolia Donkeys date back beyond the Ottoman Empire; they were used alongside mules and horses to transport goods along rivers, steep slopes, and rocky terrain. Most often they were used by peasants to transport goods before the roads and bridges were built. 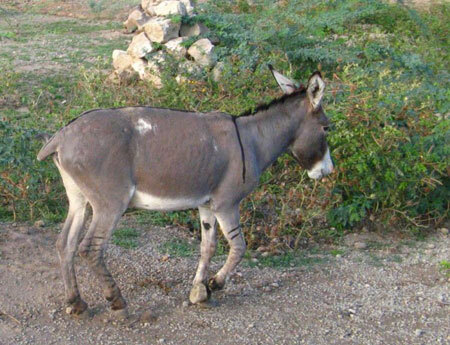 Today they are still extensively used in the East Anatolia Region and Northeastern part of Black Sea Coast in the more mountainous areas where the donkey’s surefootedness is essential. The Andalusian, or Andaluz, donkey was used by the Spanish Military for stud and kept their bloodlines relatively pure over the years. Since the end of Franco’s reign, the need for a quality donkey has declined and their numbers followed. This species is endangered and threatened with extinction. Asinara Donkeys are from the isle of Asinara, Italy, where a colony of around a hundred still live in the wild. They are small donkeys with a white coat, probably because of an incomplete albinism. The Asinara donkey’s ancestors may have been imported originally from Egypt by the Duke of Asinara in 1800. Evedently by the end of the 19th century some white-coated donkeys lived on the island, probably they were abandoned by the inhabitants that had moved to Stintino in 1885 when the island had become State Property. Some other evidences refer that in more recent times there have appeared a few white coated examples. The breed is rustic and frugal. Australian ‘Teamster’ Donkeys evolved from Donkeys were mainly introduced into Australia in the nineteenth century, especially for use in the hot, dry, harsh interior of the continent. Donkeys in Australia had a mixture of blood from British as well as Nubian and Arabian strains, all of which were imported into the country in the early period of European settlement. With the increasing use of mechanized transport, donkeys largely outlived their usefulness, and many were released, forming feral herds in outback areas. 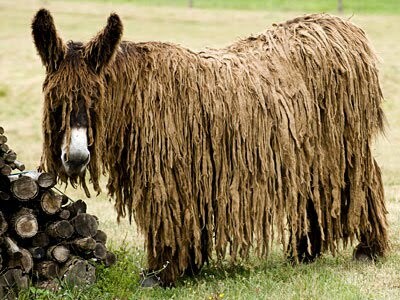 It’s roots have been traced back to Somalia but the Catalan Donkey has been adopted as the symbol of the Catalan people (perhaps in defiance of the Spanish national bull). Their numbers became critically low late in the 20th century, but breeding programs have saved them from extinction. The Cotentin donkey, or Ane du Cotentin, comes from Lower-Normandy and was once used to transport cow’s milk. Due to modernization of agriculture in the mid-20th century their numbers dwindled. Thanks to modern appreciation for the bloodlines & the creation of a breed registry in 1997 their numbers continue to grow. Historically, the donkey was never used extensively in Britain – except in Ireland, where it became the principal draught animal for cottagers and smallholders throughout the country. Eggs and butter, which were the chief produce of the widespread small farms, were brought to market weekly by a patient donkey harnessed to a small cart, usually driven by the farmer''s wife. While some breeders refer to their donkeys as “Irish” and others as “English”, they are essentially the same breed and are grouped as English/Irish by the Donkey Society of New Zealand. 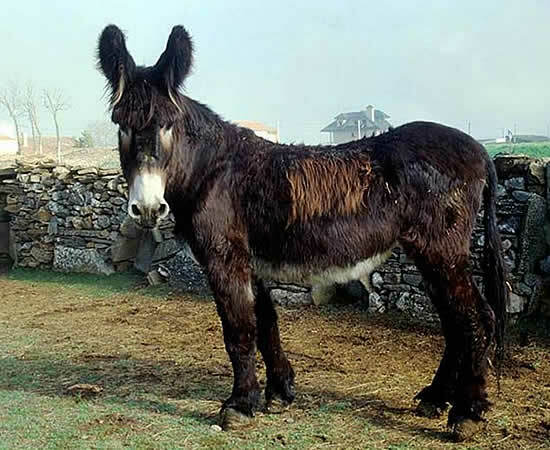 There are no Donkey breeds that start with the letter F.
A hinnie or hinny is a domestic hybrid produced by a horse stallion (father) and a jenny donkey (mother). 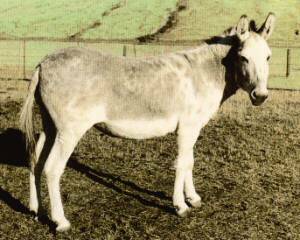 It is the opposite cross to the common mule, which is the product of a jack donkey (father)and a horse mare (mother). There are both male and female hinnies. A male hinny is properly called ahorse hinny, and a female hinny is properly called amare hinny. In England, a hinny is commonly called ajennet. Hinnies in general are slightly smaller on average than mules. It is believed that as donkeys are generally smaller than horses, the growth potential of horse offspring is influenced by the size of the womb of the mother. 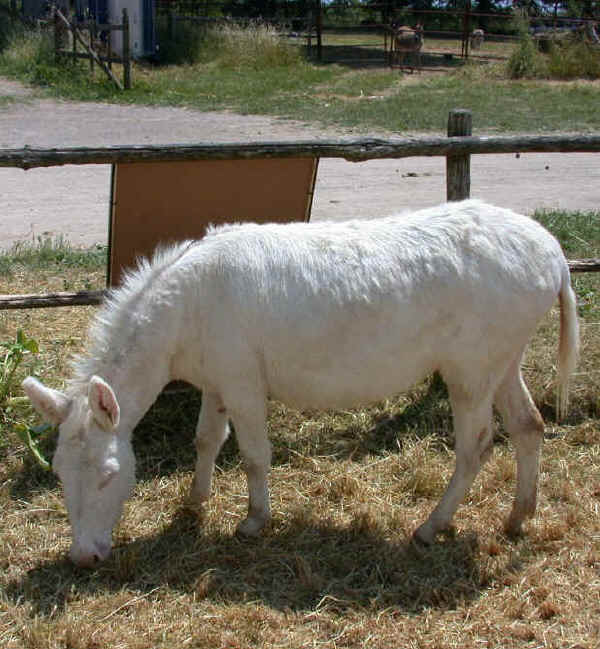 American Mammoth Jack Donkeys, or Asno Americana, are descended from multiple breeds of donkeys imported to the United States including Maltese, Poitou, Andalusian, Majorcan, and Catalonian donkeys. The males are typically 14 hands tall and the females are about 13 hands. Mammoth Jacks have a draft horse-like build. They are a tall, sturdy, and reliable animal, and compared frequently to work horses. Mammoth Jacks can be found in black, chestnut, spotted, dun, white, dapple gray, bay or palomino; however, chestnut is their most common color. 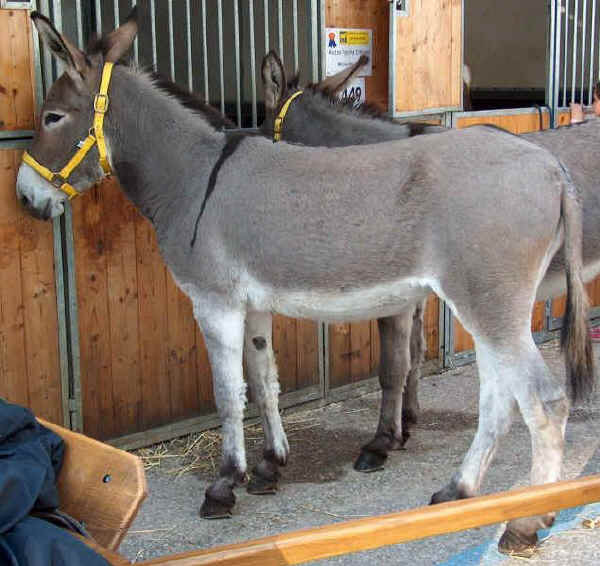 Martina Franca Donkeys are large size donkeys (135-160cm high at the withers) are from Apulia, Italy. 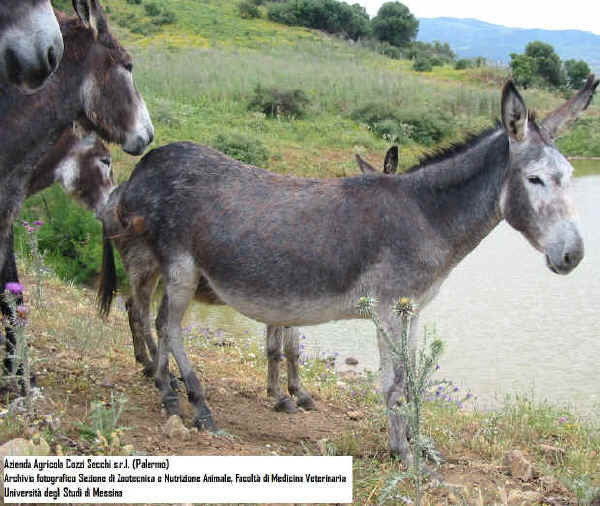 Most likely they were developed by crossbreeding local dark-coated donkeys with donkeys from Catalogna imported into the area at the beginning of the 16 century. They have a quite lively temperament. They are well-adapted to difficult and rocky ground and are used as beasts of burden. Mary donkeys are large donkeys from the Ashkhaad and Mary regions of Turkmenia. 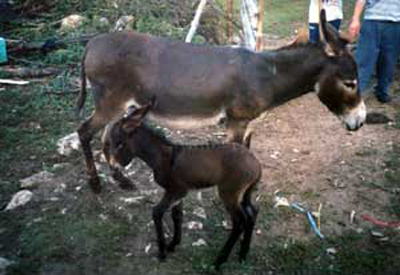 There are both a large and small version of the Mary donkey. Large versions of the male Mary donkey are typically 119-120cm, and females are 116-118cm. Fully grown Mary donkeys often weigh around 650 pounds and can carry 150-275 pounds. 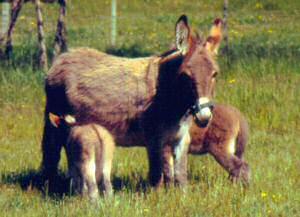 Mary Donkeys are closely related to the Iranian Hamadan donkeys whose descendants can also be found in Azerbaijan. They are no longer widely used as pack animals, plus expeditions and mountain rescue parties require only a small number of animals, as a result today their numbers. 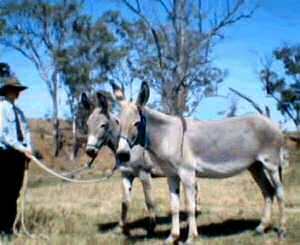 A mule is the offspring of a male donkey (Jack) and arnfemale horse (Mare). Mules can be lightweight, medium weight, or when producedrnfrom draft horse mares, of moderately heavy weight. 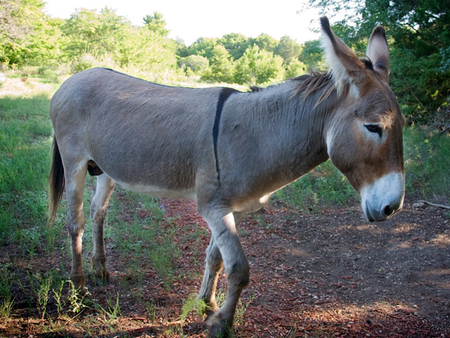 Mules are more patient, hardy and long-lived than horses, and are less obstinate and more intelligent thanrndonkeys. Pantelleria Donkeys are an ancient breed from Pantelleria island, Italy, where they were common until a few decades ago. Pantelleria Donkeys are very strong, in the past the were used to carry extremely heavy loads around the paths of the island. They represented an important resource for the island and Trapani province. The hybrids (mules) were highly appreciated abroad, as well. Also at some time in the past speed races were organized on track and Pantelleria Donkeys was preferred to horses, as they were more suitable to be ridden on any kind of ground. Unfortunately they are now almost totally extinct. The Parlag is a Hungarian donkey that came to them via the Celts and Romans had a hand in shaping their lines. Like most of their brothers the lack of need was a determining factor in the decline of their numbers. Today their lines are kept alive by hobby breeders in central Hungary. 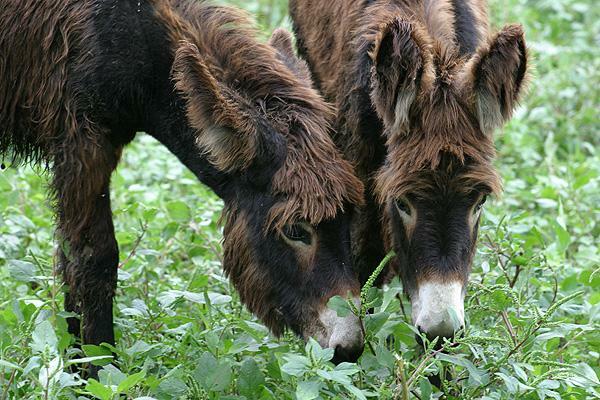 Poitou Donkeys originates from the Poitou region of France, and they are most likely related to the Poitevin horses. It is thought that they were introduced in France by the Romans and may have been a wealth status symbol for French Nobility. They were also regarded as the finest and strongest donkeys in France, since they were as tall as large mules with legs and joints as large as most carriage horses. Ponui donkeys are New Zealand''s only feral donkey breed. The feral herd is established on Ponui Island in the Hauraki Gulf, east of Auckland. They are descendants of three animals imported from Australia in the 1880s by the Chamberlin family, who obtained title to the island in 1854. Ponui donkeys are mostly light grey in color, with a darker dorsal stripe, and stand about ten hands (one meter) high. 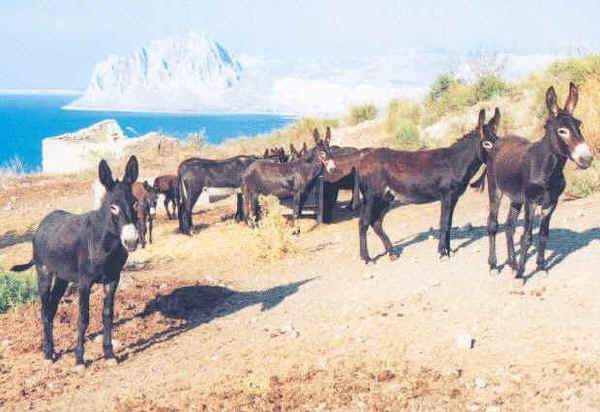 In recent years a number have been brought to the mainland and rare breeds enthusiasts are currently trying to build up a viable, genetically pure population of these sturdily built and docile donkeys. Content and Photo Source: New Zealand Rare Breeds (http://www.rarebreeds.co.nz/). 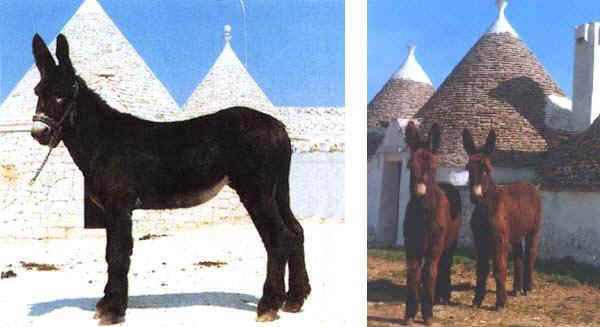 Ragusano Donkeys originated in the area of Ragusa, Modica, Scicli S.Croce Camerina in Sicily. They are a new breed, officially recognized in 1953, when during selection studies the Horse Increase Institute of Catania (they keep the registry office) was able to fix a few characteristics. All the donkeys living in Sicily are to be traced back to the Pantelleria breed, especially those in the province of Trapani and to the usually called Sicilian breed, , present all over the island. 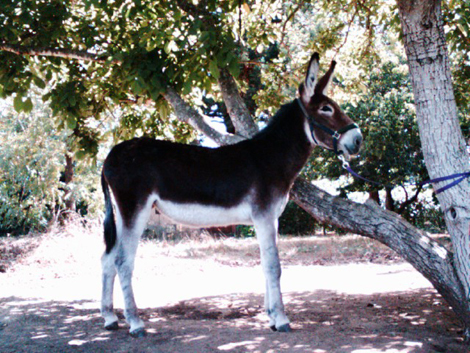 The crossbreeding of the two above and with the Martina Franca breed, with blood mixing of Catalano donkey, after various crossings, produced some very good examples. Sardinian Donkeys are, unsurprisingly, from Sardinia, Italy. They have been on the island for a very long time. They are lively and rustic and are used as beasts of burden and farm labor. They are highly appreciated in Italy and abroad. They a have a lively temperament and no special needs. It is believed that the first donkeys came to North America with Christopher Columbus in 1495. 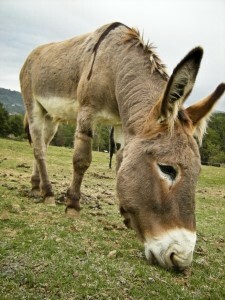 Donkeys were highly valued as sires for mules. Jacks, or the males were primarily used as pack animals and the Jennies were used for riding. 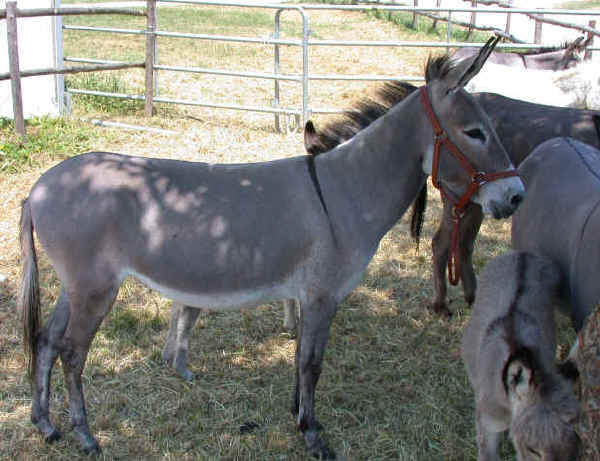 Donkeys were also used in Mexico after the conquest of the Aztecs in 1521. Mules were used in silver mines and for breeding mules. 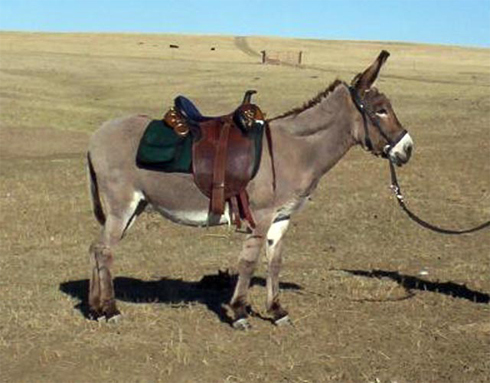 Donkeys were used largely in the western United States during the nineteenth century during the gold rush as pack animals and for use in mines and ore-grinding mills; however, the introduction of railroads in the West ended the popular use of donkeys in the United States. Many donkeys were turned loose and became free roaming burros. 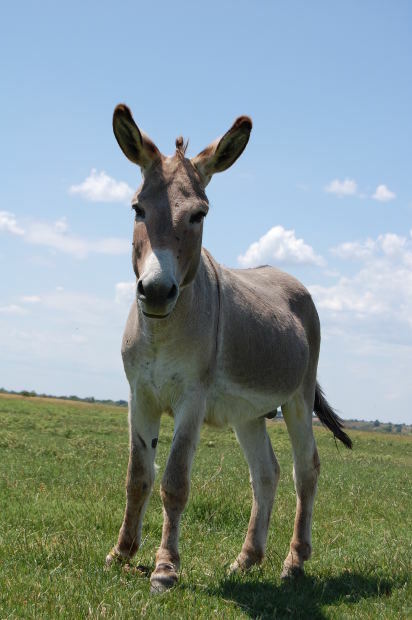 There are no Donkey breeds that start with the letter W.
Another Spanish donkey, the Zamorano-Leones donkey was bred to be robust for traveling and trade & later used to create large work mules. Their range has dwindled due to lack of necessity and they can now be found only in the Zamora and Leon provinces.